New baby quotes offering congratulations may also relay wishes that we have for the new mother and father and the future of their family. A congratulatory quote or thoughts based on a favorite Bible verse does more than simply congratulate the couple on the birth of their child; a short, personalized phrase can bring a smile on a busy day when there is more than the usual expected work surrounding the care of a newborn infant or it can serve to remind us that with each child comes a new beginning of a life filled with hope and promise. As Eda J. LeShan stated, the wonder, hopes and the dream of possibilities is endless and even more amazing when all of the above is contained in such a tiny, fragile human being. How could parents fail to be moved by the depth of these words? A little humor never hurts and can alleviate stress PLUS a funny saying can be just as motivational as a serious one. If sending a card to congratulate a friend who has just had a new baby you might consider adding the following wording on the inside including personal details if you like: Parenting may not be the easiest job in the world, but it is definitely the best one ever! Congratulations (your friends' names here) on the arrival of your new baby. This is one of my favorites of all the zebra quotes and sayings for a baby's nursery that I've found. Of course, it's credited to the master of inspirational quotations for kids himself, Dr. Seuss. Depending on the personal mindset of the reader, these words can take on a variety of meanings. When read in context in the Dr. Seuss book (On Beyond Zebra) they are issued as a challenge to the reader to imagine an alphabet that reaches beyond the letter "z". However, I added it to my list of favorites of zebra quotes and sayings. for a baby's nursery not only for its educational meaning but as it applies to life lessons. 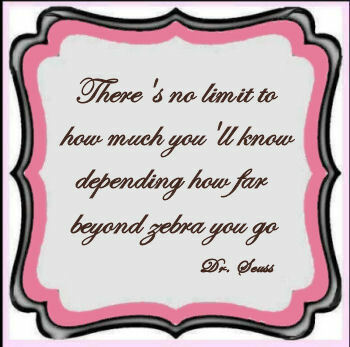 You might imagine that a child that is raised in sight of the words "There's no limit to how much you'll know, depending how far beyond zebra you go." either framed and hung on the wall or displayed via wall decals would fully comprehend that the world is indeed their oyster and that the possibilities of the things that they might achieve are truly endless. Another popular zebra quotation open to interpretation is found in Proverbs, "A leopard cannot change it's spots, nor a zebra it's stripes." Perhaps parents could introduce this to their little ones at an early age as a lesson to make every small decision carefully because once the die is cast; it's not easily broken. I hope that you enjoyed today's inspirational quotes and that you will visit us often. If these zebra sayings have personal meaning to you, please feel free to share. Certainly evildoers deserve punishment but there is a great difference between God's justice and ours. The problem is that man thinks of justice in a different way than God. We believe that justice has been served when the perpetuators of crime or evil works are punished with a jail sentence or even sentenced to death. Humans tend to focus on the eye for an eye brand of justice for the evil that people do. Thankfully, God does not view things in the same way and He practices to give us what we need rather than what we deserve and that is also what He requires us to do in our dealings with others. And mercy is something that we all need! We need for God to be merciful toward us and we need him to love us, forgive us and accept us. We are well aware that even the most devout Christians do not always walk in faith as we should. We are often separated from our beliefs and the way that we live out our lives do not reflect our spirituality. Please refer to this inspirational Bible verse about love and kindness, Micah 6:8 that tells us, "What does the Lord require of you but to do justice, and to love kindness, and to walk humbly with your God?" When the Lord asks us to carry out justice he is requiring us to live and walk in our faith in our daily lives. Just going to church on Sunday is not enough. Our faith should lead us to work from justice and to witness to others in the way that we conduct our lives. To be truthful there's no danger in mistaking us for Christ our Savior but He should be seen in us in the way we live. It’s a goal worth having to bring God's Justice and ours closer together and to conduct acts of kindness that remind others of our Lord who is the kindest of all. Communicating with God through prayer is the very best way to deal with what the world throws at us. In fact, we owe it to ourselves to start each day in fellowship with our Creator to give us the strength and inspiration to accept His will and to acknowledge his wisdom. When my mother was a child her mother was diagnosed with breast cancer. At this time, this more or less was considered a death sentence. Medical treatments were much less advanced in those days and the choices open to her were radiation and radical surgery neither of which offering any real guarantee of survival. In fact the doctor told her to get her spiritual house in order and be prepared for the worst. Feeling better best chances were with surgery that is the option she chose. After the surgery the doctor told her that even with radiation she would probably live no longer than a year or so. The treatments made her so sick and she realized that for that one short year she was going to have no quality of life and stopped so that she could enjoy her children for the short time she had left to her. My grandmother and grandfather had only been Christians for a few years but remembered hearing a sermon on how God had the power to heal and referred to this inspirational Bible verse in James: 5:14-15 that tells us, "Is any sick among you? Let him call for the elders of the church; and let them pray over him, anointing him with oil in the name of the Lord: And the prayer of faith shall save the sick, and the Lord shall raise him up; and if he had committed sand, they shall be forgiven him." So they called the elders as indicated that they should in the Bible verse and asked them to come and pray for my grandmother. The elder said that they had never received such a call and had not prayed over a sick person in this manner before but has asked a prayed a simple prayer asking for this young mother to be healed. The next day she was released from the hospital to go home and prepare to die. However, I am here and able to tell you this story today because that small group of believers gathered together in her hospital room for the purpose of communicating with God through prayer in her behalf. You see, she was healed and live not only to raise her children but to see her grandchildren. Our heavenly Father created us to stay in fellowship with Him and to communicate with him through prayer and offers great benefits if we will just call on Him for guidance. Do you have a need that communicating with God through prayer might be filled? We should all work diligently to develop our relationship with Him and to communicate our needs to Him and not look to the opinions and approval of man for fulfillment. When I read the following Bible verse, in those quiet moments when my mind is roaming free, I often wonder how God made us and why. I Corinthians 12:12-20 tells us, "Now the body is not made up of one part but of many. If the foot should say, ‘because I am not a hand, I do not belong to the body,’ it would not for that reason cease to be part of the body. If the whole body were an eye, where would the sense of hearing be?" While on vacation recently, we were lounging on the beach with all of our children playing around us, when our three-year-old daughter came running from behind my lounge chair to shout at the seagulls telling them, "Go away!" "You're not scaring me!" Her delivery was so convincing that the birds actually scattered for a few moments. Amused, I turned back to reading my book until I heard my other daughter crying. Nowhere near as brave as her older sister she was afraid of the birds and was standing riveted in the hot sand in distress. Then here comes my three year-old began telling the birds to get away from her sister! Once again they took off and my toddler was able to relax for a moment. This event reminded me of just how God has made us all so different. Even members of the same family so close in age have completely different personalities. What this tells me is just how each of our personalities fit together as part of God's plan for us. My younger daughter was easy creating a work of art (toddler style) until she became afraid of the birds. But her big sister was ready, willing and able to help remove the fear so that she could move on with her artwork. I believe that how God made us was to arrange each of us to play an integral part in the “body” of His family all working with one another in His perfect plan. The Lord puts people in our lives that are capable of assisting and helping us calm our fears and get through difficult times so that we can finish our assigned masterpieces. But it is our choice to accept their help. The ultimate friend, protect her and helper is our God. He is all knowing and is aware of exactly what we need even before the moment is at hand. He is the ultimate defender that gives us the strength to stand against trouble and resist temptations. He knows exactly what we need because we are His children and created in His image. As His children all we need to do is listen for His instruction and accept his help. When we spend time at His feet and allow Him to be the greatest influence in our lives we will have an existence full of favor and benefits of salvation and there are so many inspirational Bible verses that attest to this as fact. quotes: "Come unto Me, all ye that labor and are heavy laden, and I will give you rest. Take my yoke upon you, and learn of me; for I am meek and lowly in heart: and ye shall find rest until your souls. For my yoke is easy, and my burden is light." How we deal with our pain and suffering is the result of how we perceive it and the reason for it. Jesus is ministry was filled with many setbacks, rejections and painful times, yet at the end of His life here on earth He continued to forgive others of their faults and ignorance. His perception of pain and suffering was that of an easy yoke and a lighter burden. Even in the face of much strife and suffering he continued to make away where there seemed not to be one. In this Bible verse about pain and suffering he instructs us to learn how He himself managed to shoulder the burdens because he knew better than any other that this world was going to continue to bring challenges to Christians on a daily basis. He also reminds us that while we are in this world we are not OF this world. He does this so that our perception of day-to-day struggles should be looked at through His eyes and with His nature. We should constantly remind ourselves that we should not allow the obstacles that are thrown in our path to skew our perceptions and well on the problem without taking them to the problem solver, Jesus Christ. His goal was to make our pain and suffering lighter and our yoke in life easier by learning from him, leaning on him and most of all excepting the salvation that he offered us. Here’s my favorite Bible verse regarding God’s plan for me Jeremiah 29:11 tells me, "For I know the plans I have for you," declares the LORD, plans to prosper you and not to harm you, plans to give you hope and a future." I should have this inspirational Bible verse pasted on my bathroom mirror, refrigerator,etc. so that I will be reminded that I am not in control and to look for God's guidance before jumping in and pushing forth with my own will. I’m hard headed and don’t always stop to pray about what God’s plans might be. Whenever I have a goal and I fail to reach it there are times when I have immediately set about trying to figure out a way to fix it and when that doesn't work I might take off on another track that would “work”. And then I might begin to rack my brain to solicit help from a friend or family member who might be able to help me solve the problem. Never mind that the persons help whom we seek may not have any experience whatsoever in solving the type of problem that I'm having; they are available they are willing and by this time I'm desperate so their help is better than nothing at all. Right? Recently I was going for just such a situation where I had stored a large number of things in a rented storage facility. Realizing that I had no way to lock the door I went in search of a good padlock at my local hardware store. I had to spend a little more money but the lock that I bought was one of the most secure that they had for sale and it serves the purpose as it kept my belongings safe. My sister was about to move into her first apartment so I invited her to come for a visit and go through my storage unit to see if there was anything that she could use. After she arrived I went to get the key so that she could unlock the unit. I always kept the key on one particular key ring however I had recently given another friend permission to look through the stuff stored inside and when I went to find the key for my sister it was not where I had thought it would be. Apparently when my friend brought key back I had stuck it in a drawer somewhere. Since my sister was only going to be in town for a limited amount of time I had the brilliant idea of borrowing some cutters and simply cutting the lock off. Long story short, this plan failed so we started to search for the padlock ski once again and luckily found it. We headed to the storage unit once again with key and hand ready to open the padlock only to find that our great idea of using cutters had damaged the lock and key would only partially open it. A passerby suggested that he could go and get an electric saw and cut the lock off which seemed like a good idea until the lock ate the blade. The lock was still holding tight although it now had several dent in a couple of scratches that the saw blade had made. I realize that the only option left to us was a locksmith who would charge a substantial fee. It was around this time that I realized if I had not been so impatient, given up and pushed forward rather than continuing the search for the missing key in the first place we might have opened the storage unit with no problems. It struck me that I often deal with God’s plan for me in the same manner. When He puts a plan or a project in front of me to guide me with the least amount of suffering pain and frustration often questioned the conditions or the timing and end up second-guessing God and sabotaging things. I often let individuals and circumstances intrude that are not good for me because I become desperate or impatient. Sure, there are times when I do get the desired results but my impatience can create much unnecessary turmoil. When I jump ahead of God’s plan for me just because I'm too lazy to work through things or because I am in a hurry to make things happen I create chaos. God's plan for me is to show me the way to go and if I manage not to get in such a hurry that I try to outguess God it will save me time, frustration and as illustrated in the example I wrote about in this article, money.